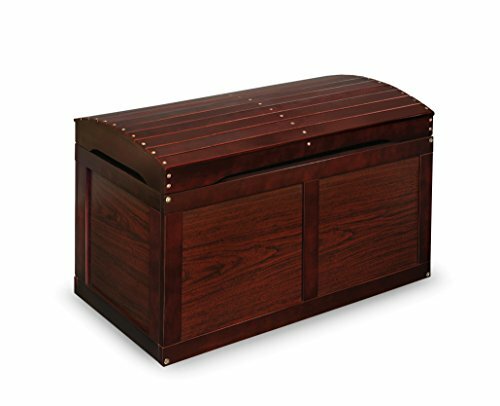 Barrel-top chest is the perfect place for storing special toys and stuffed animals. Finish Dark Wood; Attractive styling has a treasure chest look - perfect as a place for storing special toys and stuffed animals. Also great as easily accessible storage for baby blankets and bedding! ; This barrel top Toy Chest measures 31 inches L x 17 inches D x 19 inches H on the outside. ; Interior box dimensions of 29.25 inches L x 15.5 inches D x 13.75 inches H. Inside of lid adds another 1.5 inches the storage capacity. Quality hardware with safety support hinge. Lid opens fully, and will also stay open in any partially open position. ; The safety hinge secures the lid in the open position so it won't slam shut on your child. ; Made with solid hardwoods and veneers. Bottom panel is made with engineered wood hardboard. ; Finish is non-toxic. ; Built to last for years. ; Easy to assemble with a screwdriver. Illustrated instructions included. ; Product may vary slightly from shown. If you have any questions about this product by Badger Basket, contact us by completing and submitting the form below. If you are looking for a specif part number, please include it with your message.